This guide will lead you to the best information resources in Art and Art History. 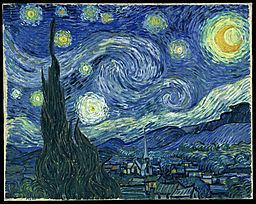 Image: Vincent van Gogh, The Starry Night, 1889 . Wikimedia Commons, Public domain. Begin your search in reference sources. Good background information may be found in reference sources. Start your search for information in Oxford Art Online, a collection of full-text art reference sources. Journal articles provide in-depth information, new research, or current information about very specialized topics. Newspaper articles are useful for exhibition reviews, media coverage of artists/art, monitoring the popular reception to art. Books and eBooks help put your topic in context with other important issues, summarize research, and often provide a bibliography. The Catalogs tab provides sources for Auction Catalogs, Auction Records, Catalogues Raisonnés, Corpora, and Museum Catalogs. Dissertations provide in-depth lengthy scholarly research on narrow topics. The Images tab provides links to image databases, information on how to search for embedded images, and websites that contain image collections.